When plastic was first invented, its makers could not have predicted in their wildest dreams that their creation would be so integral to everyday life a century later. A documentary film titled A Plastic Ocean by Australian journalist Craig Leeson shows how devastating plastic waste can be to our environment. Leeson originally set out to film the largest animal known to have existed, the blue whale, off the coast of Sri Lanka, but what he found was an abundance of plastic waste. A Plastic Ocean presents several alarming facts to change perceptions about plastic usage. It claims that of the nearly 300 million tons of plastics produced annually, half of it is single-use plastics. Of that, eight million tons end up in our oceans every year. While the cold, hard numbers can come as a shock to many, the documentary also does not shy away from using gruesome footage to drive its point home. A dolphin was filmed swimming erratically to dislodge a plastic bag that had got stuck on its fin, while an animal carcass long consumed by decay still retains the small plastic pieces it had ingested, likely the cause of death. As more and more life in the ocean meets its end as a result of plastic pollution, A Plastic Ocean reminds us that humanity will reap what it sows. Scientists in the film find that as plastics enter the ocean, the combination of UV rays and saltwater degrade the plastic into smaller pieces, which are ingested by marine life. The toxic chemicals in the plastic are then stored in their tissue, and pass through the food chain until they eventually end up on our dinner plates. The problem does not end at supper, as the plastics often wash up on our shores, creating even more problems. People of the island nation of Fiji used plastic in lieu of firewood for economic reasons, brushing off the health hazards as “something you’ll get used to”. Meanwhile, coastal residents of Tuvalu have seen their home becoming increasingly saturated in plastic, driving off the fish they used to dine on. “How can a disposable product be made out of a material that is indestructible? Where does it go?” freediving world champion Tanya Streeter asked during a 2012 TEDx conference in Austin, Texas. Those that think Indonesia is off the hook just because A Plastic Ocean’s main focus is on American society should think again, as Indonesia was named the second-largest source of marine plastic waste, after China, in a 2015 study in the journal Science. The report found that Indonesia contributed an estimated 0.48 to 1.29 million tons of plastic to the ocean in 2010. For Indonesia’s part, the government has pledged to reduce the amount of marine debris by 70 percent by 2025. According to the Environment and Forestry Ministry, plastic bag use in Indonesia has increased over the past 10 years to approximately 9.8 billion plastic bags per year, of which 95 percent end up unprocessed. In 2016, a trial regulation by the ministry, in cooperation with the Association of Indonesian Retailers (Aprindo), charged customers Rp 200 (US$0.01) for their plastic carrier bags. By October, the policy had been stopped altogether. The makers of A Plastic Ocean concede that the use of plastic has become so ingrained in our life that eliminating it completely would be an impossible task. 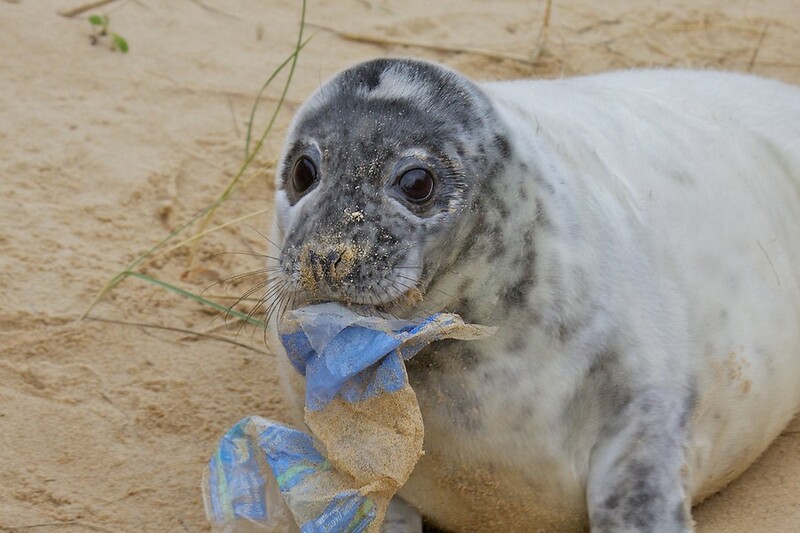 They instead implore viewers to avoid plastic products as much as possible, including single-use plastics such as carrier bags. This is a sentiment shared by Tiza Mafira, director of Diet Kantong Plastik, an NGO opposing the proliferation of single-use plastic bags. According to Tiza, single-use plastic products such as carrier bags or straws are not essential most of the time. “I carry a shopping bag with me all the time, along with a set of stainless steel cutlery and a straw. This is to avoid using plastic cutlery when I eat take-outs,” Tiza said after the screening of A Plastic Ocean at American cultural center @america in central Jakarta. Tiza added that she composts most of her organic waste at home, keeping her plastic bag use to a minimum. Meanwhile, Yuyun Ismawati Drwiega of Bali-based environmental NGO BaliFokus said that while consumers should reduce their plastic usage, the most important part lay in the hands of the government and manufacturers. “As users, we can only consume what is available to us, so it’s not fair if we put too much of the responsibility on the public to reduce plastic usage while production does not decrease,” Yuyun said, adding that government regulations and actions of corporations should go hand in hand, as opposed to being on a voluntary basis. The United States ambassador to Indonesia, Joseph R. Donovan Jr., who also attended the screening, said that youth involvement at a community level was as important as corporate governance.